WWII Valor in the Pacific National Monument staff, from left, back row: Jay Blount, Frank Middleton, Robert Joslin, Kyle Neiser and Dan Brown; front row: Pamela Flores, Vianna Lam, Kenneth Mitchell, Jacqueline Ashwell, Patty Brown, Daniel Martinez and Naomi Drye. NPS centennial remarks by Superintendent Jacqueline Ashwell, given at WWII Valor in the Pacific National Monument on Aug. 25, 2016. It is an honor to provide remarks on this, the Centennial of the National Park Service. Thank you for joining us here at World War II Valor in the Pacific National Monument, home of the USS Arizona. 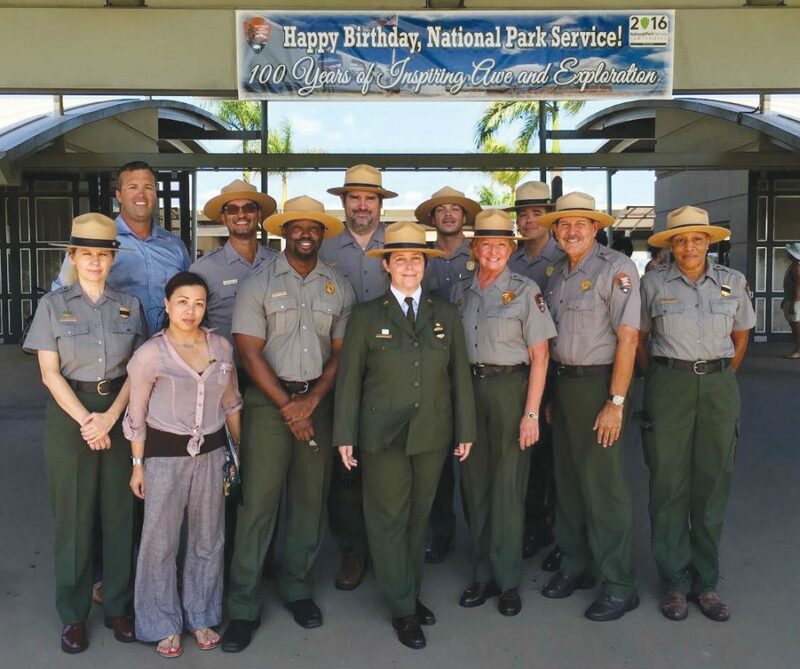 There is no more fitting way to honor the birthday of our national parks than to visit one of the 413 units of the National Park System, and we are touched that you are here to celebrate with us. Here at WWII Valor in the Pacific it is a truly momentous year. It is the Centennial of the National Park Service, in October it will be the centennial of the commissioning of the USS Arizona, and, of course, this December we mark the 75th anniversary of the attack on Oahu which launched the United Stated into the Second World War. In 2016, much has changed. National parks are now more than amazing landscapes and places to recreate. They have come to be places where we strive to understand the American experience as well. As the National Park Service moves into its second century of service to this nation and the world, we are working hard to tell a more comprehensive and inclusive story, one that incorporates not only the moments that strengthen our connection to each other, but also the moments that we must never forget. For example, here on Oahu, the recently-established Honouliuli National Monument serves as a powerful reminder of the need to protect civil liberties in times of conflict, a lesson that America has learned, and will hopefully remember. Here at WWII Valor in the Pacific, we recognize our now enduring peace with Japan, which seventy-five years ago at Pearl Harbor would have seemed unfathomable. That story of peace and reconciliation, which the National Park Service shares with millions of visitors, gives hope to new generations of people from across our planet – that seemingly intractable disagreements can be overcome. These are the stories of national parks. This is why we, as a people, have set aside the most beautiful and most meaningful places for this and future generations to explore, to learn, and from which to gain inspiration for a better future. This birthday? It’s not just about us, those who wear the green and gray. It’s something we should all celebrate, because it’s something we’ve done together. We set parks aside because society has recognized the benefit that parks provide. They are important places of reflection, they allow ecological processes to occur with less impact from our growing populations, they create jobs and give economic benefit to our communities, and they provide us with places of solitude – ever more important in modern life. And while I am extraordinarily proud to serve alongside so many incredible professionals, from the ranger who greeted you at the front gate to the maintenance staff who keep up with the 4,000 daily visitors to this Monument, to our many partners who support us, we can’t do the work that we do alone. It is only with the support of the public that we can achieve our mission. When you tell others of the experiences you’ve had at National Parks, and encourage them to care about America’s most treasured places, we as a society gain more stewards, more advocates for our parks. When you volunteer at your local national park unit – and they exist in every state and territory – you give back to your country. Thank you for all that you’ve done to support us over the past 100 years, and thank you in advance for what we will do together in the second century of the National Park Service. Next Next post: Mahalo to Donors!